The Heddon Zara Spook invented the walk-the-dog retrieve more than 50 years ago, and despite being copied literally hundreds of times during the past decade, the Zara is still the king of topwater fishing. The Zara Spook is just the right size and produces just the right side-to-side retrieve for anglers looking for big fish. 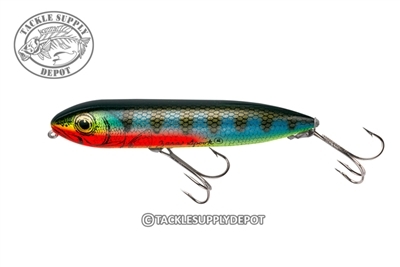 The Zara Spook has been a go-to lure for bass, striper and pike fishermen for generations. Heddon Saltwater Super Spook Heddon Saltwater Super Spook Jr. Heddon Tiny Torpedo Heddon Saltwater Chug 'N Spook Jr.